Even before the first DC-3 had made it's first flight, Douglas Aircraft and United Air Lines were discussing a 4-engined aircraft with double the capacity, which led to the first of the great family of Douglas 4-engined airliners. In 1936 American, Eastern, Pan American, and TWA decided to join United and put up $100,000 towards the cost of designing and building the prototype DC-4. TWA and Pan American later withdrew in favor of the Lockheed L-049. When the prototype appeared, it was a very big aircraft, with four Wright R-1820 engines of 1450 hp each. It first flew on June 7, 1939, and was delivered to United for demonstration flights. However, it became apparent tht it was something of a maintenance nightmare, and was not attractive economically. Thus, the partners decided on a smaller, less complicated derivative, also to be known as the DC-4 (so the first DC-4 was renamed the DC-4E). Thus, Douglas started over with a somewhat smaller (and much more attractive) design, using P&W Twin Wasp R-2000's. This resulted in the definitive DC-4, with all of the features found in all Douglas propliners from that point forward, except pressurization. The fuselage was a long cylinder (handy later for stretching into the DC-6 and DC-7), tricycle landing gear, and a tall single fin. Three of the 5 sponsors (United, Eastern, and American) placed orders totalling 60 DC-4's, but production and delivery were interrupted by WW II, and by the end of the war over 1000 had been produced. Over 500 of these were sold to the airlines after the war, and with Douglas producing 74 more, many airlines started long-distance routes with DC-4's in 1946-47. After the much faster, larger, and pressurized DC-6 series became available, the DC-4's tended to be relegated to secondary routes and carriers, and were a mainstay of regional airlines on their premium routes. They were later converted to freighters, fire sprayers, and other configurations, and many DC-4's are still flying today. 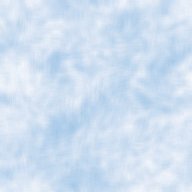 Click on the image to download the plane. FS2004 Pan American World Airways DC-4. The plane that begain the dynasty of 4 engine Douglas propliners, here is the DC-4 from Jens Kristensen, in UAL, TWA, PAA and SAS liveries (among many others), and has a panel too. It's complete with updated flight dynamics from FSAviator. Pan Am used it on its original long-distance overwater routes. Thanks!Last updated on 4/12/13. FSX Version. Last updated on 4/12/13. Operations Update: This is a flight dynamics and panel update to the FS2004 v3 DC-4 listed above. It allows you to fly more accurately, decade by decade. This update demands imposing rigorous multiple concurrent compliances, during manually flown approaches, and is not for the beginner. For a simpler experience, download the original v3 version above. This is a complete package that can be installed alongside the v3 version above. By FSAviator and Tom Gibson. Last updated on 3/31/16. FS2004 Western Air Lines DC-4 1950. Wayne Tudor has painted up Jens' DC-4 in the early colors of Western, the only trunk carrier flying only in the western US in the 1950's. The "Arrowliner" flew the major routes for Western, complete with the first iteration of the famous "Indian Head" under the rear fuselage. Requires the FS2004 PAA base file or FSX Version. Last updated on 1/19/06. FS2004 Western Air Lines DC-4 1957. Wayne has also painted up the DC-4 into the last colors it ever wore at Western, just before further deliveries of DC-6B's pushed them aside. Requires the FS2004 PAA base file or FSX Version. Last updated on 1/19/06. FS2004 1948 United Air Lines DC-4. Jens has painted his new DC-4 into the earliest colors of United. United was one of the last major US airlines to fly the DC-4. Requires the FS2004 PAA base file or FSX Version. Thanks again! Last updated on 1/19/06. FS2004 United DC-4. After the Mainliner scheme above, United went with this bare metal scheme that (with the addition of a white top) lasted until 1958. Wayne painted this one too - thanks! Requires the FS2004 PAA base file or FSX Version. Last updated on 2/3/06. FS2004 1955 United Air Lines DC-4. Wayne has painted a converted C-54 into the later white top colors of United. Thanks! Requires the FS2004 PAA base file or FSX Version. Last updated on 2/3/06. FS2004 1950 American Air Lines DC-4. American also started their transcon service with converted C-54's, and Wayne has done up that scheme as well - well done! Requires the FS2004 PAA base file or FSX Version. Last updated on 1/19/06. 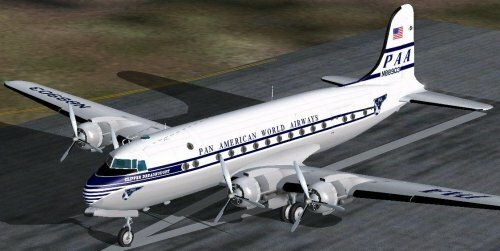 FS2004/FSX 1946 American Air Lines DC-4. Here is a very early livery for an American DC-4, while still on lease from the USAF. It's nicely painted by Fongman Chan - thanks! Requires the FS2004 PAA base file or FSX Version. Last updated on 4/12/13. FS2004 PSA DC-4. Dave McQueen has painted Jens' DC-4 to represent one of Pacific Southwest Arlines' early aircraft, the DC-4. PSA started as a low-budget airline within California, and graduated from DC-4's to Electra's, and on to 727's and DC-9's. It eventually became the dominant airline within California, and after deregulation expanded all over the West. It was absorbed by US Air, but most of it's routes have been dropped. Many Californians will miss the humor and spirit of the airline that said "Catch our Smile". Thanks! Requires the FS2004 PAA base file or FSX Version. Last updated on 4/12/13. 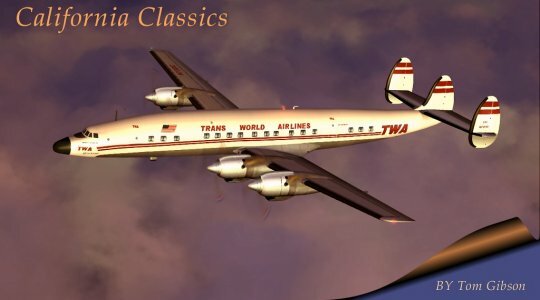 FS2004 TWA DC-4. Wayne Tudor has painted Jens' DC-4 into the early bare metal colors of TWA. Trans World used the DC-4 for it's earliest domestic and international services after WWII, before the Connies arrived. These would be their last Douglas planes until the DC-9's. Thanks - it looks great! Requires the FS2004 PAA base file or FSX Version. Last updated on 1/19/06. FS2004 British Commonwealth Pacific Airlines DC-4. The DC-4 inaugurated service between Australia and the USA, and thus is an important part of airline history. Wayne has painted Jens' DC-4 into the early colors of BCPA, a real pioneer in Trans-Pacific flight (following Pan American, of course!). Requires the FS2004 PAA base file or FSX Version. Last updated on 2/3/06. FS2004 Santa Fe Skyway C-54. In 1947 five war surplus C-54s were purchased by the Santa Fe railroad for a startup air freight operation. Lasting only eighteen months, Santa Fe Skyway ranked number five in air freight carried among U.S. airlines until the C.A.B. refused their certificate. This beautiful paint job was done by Gary Harper - thanks! Requires the FS2004 PAA base file or FSX Version. Last updated on 4/12/13. FS2004 Flying Tiger Line C-54. This DC-4 was used by this world wide cargo company circa 1949. Gary Harper painted this nice rendition - thanks! Requires the FS2004 PAA base file or FSX Version. Last updated on 4/12/13. FS2004 Riddle Airlines DC-4. Riddle Airlines began operations in 1945 as a non scheduled carrier. Later as a mostly all cargo airline it began scheduled operations and flew passenger/cargo flights for the US military. Riddle flew C46s, DC-4s, DC-6s, DC-7s, DC-8s and Armstrong Whitworth Argosy turboprops. The name changed to Airlift International in 1963. Airlift acquired Slick Airways in 1966 and managed to survive several bankruptcies only to go under for good in 1991. Riddle was founded by John Paul Riddle, also a founder of Embry-Riddle Aeronautical University of Prescott, Arizona and Daytona Beach, Florida. Dave McQueen has painted up this beauty - thanks! Requires the FS2004 PAA base file or FSX Version. Last updated on 5/5/06. FS2004 Slick Airlines DC-4. Slick Airways was founded in San Antonio, Texas in January 1946 by Earl F. Slick. It began operations in March 1946 using ten Curtiss C-46s. Slick became a scheduled freight carrier in 1949. Slick nearly merged with the Flying Tiger Line in 1953 but the merger fell through. Slick provided transcontinental service and also flew contracts for the US military. But the airline failed financially and in 1966 Airlift International (Riddle) took over the assets of Slick. Slick flew C46, DC4, DC6, L1049 and CL44 equipment. Another great paint job from Dave McQueen. Thanks! Requires the FS2004 PAA base file or FSX Version. Last updated on 5/5/06. FS2004 Overseas National Airlines DC-4. Overseas National Airways was one of the most successful of the non scheduled airlines. Beginning operations in 1950 it operated DC-4 DC-6 DC-7 DC-8 DC-9 DC-10 and Lockheed Electra equipment. The airline went bankrupt twice, the second time in 1978 when it ceased all operations. It was used extensively by the military to transport troops to Vietnam. Thanks to Dave McQueen for painting it! Requires the FS2004 PAA base file or FSX Version. Last updated on 2/27/06. FS2004 Matson Lines DC-4. Matson Lines steamship company in 1946 was a cruise ship line sailing between the west coast of the United States and Hawaii. They entered the air carrier market with DC-4s and flew between the West Coast and Honolulu from 1946 to 1948. Dave McQueen has painted up this elusive bird - thanks! Requires the FS2004 PAA base file or FSX Version. Last updated on 2/15/06. FS2004 California Eastern DC-4. Dave has also painted up this one too. California Eastern Airways aka California Eastern Aviation was headquartered in Burbank, CA and Washington DC. Operating from 1946 until 1961 it was a contract carrier with the US military overseas and also provided non scheduled charter operations within the USA. They operated DC-4 and L-1049 equipment. Thanks! Requires the FS2004 PAA base file or FSX Version. Last updated on 2/15/06. FS2004 North American DC-4. Dave has painted up Jen's great DC-4 into the early colors of charter operator North American. It was the largest low fare airline in the 50's doing business under several names to avoid the charter airlines restrictions. Transcontinental fares were typically $99 US, quite inexpensive compared to the scheduled airlines. The CAB and the scheduled airlines put them out of business, but the public's thirst for their low fares lead to the Coach Class revolution. Requires the FS2004 PAA base file or FSX Version. Last updated on 2/15/06. 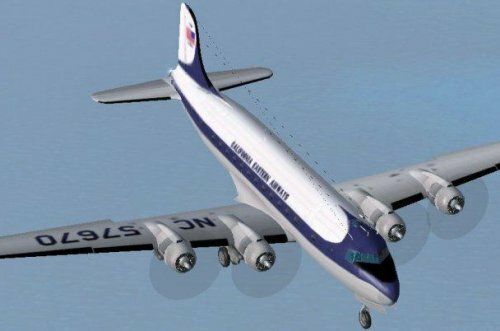 FS2004 Resort Airlines C-54. Resort Airlines of Washington DC, and Oakland, CA was a charter and tour operator between 1945 and 1960. They performed LOGAIR services for the US government. This aircraft was converted to an ATL.98 , and flew for Channel Air Bridge after 1961. Dave McQueen did a great job - thanks! Later livery by Jaap de Baare. Dayglow livery by Maarten Brouwer - FS2004 or FSX. Requires the FS2004 PAA base file or FSX Version. Last updated on 2/3/06. FS2004 Resort Airlines DC-4. Here's another version, this time from Maarten Brouwer. Thanks! FSX Version. Requires the FS2004 PAA base file or FSX Version. FS2004 Transocean DC-4. Transocean Airlines of Oakland, California operated more DC-4s in commerical service than any other airline over a 14 year period. They flew mostly over the Pacific, but also around the world. This is one of Dave McQueen's favorite airlines - thanks! Later livery. Requires the FS2004 PAA base file or FSX Version. Last updated on 4/12/13. FS2004 US Overseas DC-4. Another in the series of charter operators from Dave McQueen! Starting in 1946 United States Overseas Airlines flew mainly as a contract carrier for the US Air Force and US Navy. USOA began scheduled flights within the USA in 1958 but lack of jet aircraft made it impossible to compete with established carriers and USOA went out of business in November 1964. Requires the FS2004 PAA base file or FSX Version. Last updated on 5/13/09. FS2004 TOPAC DC-4. This repaint depicts the fictional Trans Orient Pacific DC4 from the motion picture The High and the Mighty. At least two aircraft were used in the film. This one represents the one in scenes taxiing and in flight without de-icing boots. Dave McQueen has also done the honors painting this one! And the other plane has been painted by Wayne Tudor! Requires the FS2004 PAA base file or FSX Version. Last updated on 2/3/06. Dave's scheme updated for the DC-4 version 3 by Randy Cain. Last updated on 7/25/08. FS2004 California Hawaiian DC-4. California Hawaiian was a non-sked carrier that flew between California and Hawaii with L049, L1049, and DC-4 equipment. It operated under a parent company called Airline Transport Carriers who also operated California Central Airlines. Thanks Dave! Requires the FS2004 PAA base file or FSX Version. Last updated on 2/3/06. FS2004 Great Lakes Airlines DC-4. Great Lakes Airlines, a Nonsked of Burbank, California operated between 1946 and 1962 providing irregular scheduled service across the USA. Thanks Dave for another interesting one! Requires the FS2004 PAA base file or FSX Version. Last updated on 2/3/06.